Entrepreneur and CEO of Startup Victoria, Georgia Beattie, is stirring aspiring entrepreneurs to go further, understand the impact of their decisions, and to pay it forward. The idea of making money at the cost of the environment and the community is dying. Georgia sees a new generation of entrepreneurs who are creating businesses and making choices for a more responsible and sustainable future; one in line with our conscience. Georgia’s own experience realising this was while building her single serve wine startup, Lupe Wines. A fiercely price-driven industry, the way to compete with incumbents was to use increasingly cheaper materials. Georgia couldn’t accept those rules at the cost of its impact on the environment, instead choosing to make decisions that would allow her to sleep at night. It posed a more complex product development challenge, but one that Georgia wanted to tackle. Today, Georgia talks about these kinds of decisions in the context of the Triple Bottom Line. A three-part framework that measures business performance across the social, environmental, and economic impacts. Making a smart business decision doesn’t have to come at the cost of making a responsible decision; it’s harder, but it’s worth it. Tools like the Triple Bottom Line help make it a fundamental part of your business. 2. As an entrepreneur, you don’t have to wait for permission. Answering questions from our students, Georgia reinforced that as an entrepreneur you have the control – you don’t have to wait for permission. You need to start yesterday, and if not yesterday, do something right now that takes you a step closer toward your vision. Don’t wait till you’re perfectly prepared; instead use the journey to learn along the way. Find people to talk to about your idea. The process of talking to others, particularly those who know the subject matter better than you, and being challenged will take you closer to uncovering your vision or building your business. Then take those learnings to the next conversation – it’s a way to fast-track your learning. Rooted in this concept is to not overthink the process and be crippled by inaction. Get your question, idea, or product into the real-world, test the response, and use the learnings to iterate. 3. Sending the lift down to the next generation. After selling her startup Lupe Wines, Georgia is now using her entrepreneurial experience to stimulate Victoria’s startup ecosystem through her role leading Startup Victoria. An independent body aimed at enabling collaboration between government, universities, and business to foster more talent and create pathways for startups. Taking a helicopter view of the startup landscape, Georgia wants more people to connect and work together to create more and better founders. “Entrepreneurs have a generosity of spirit. They’re really willing to share their knowledge and help you avoid making the same mistakes,” says Georgia. Aspiring entrepreneurs don’t have to do it alone. They can, and should, leverage the knowledge and networks of people more experienced than themselves. 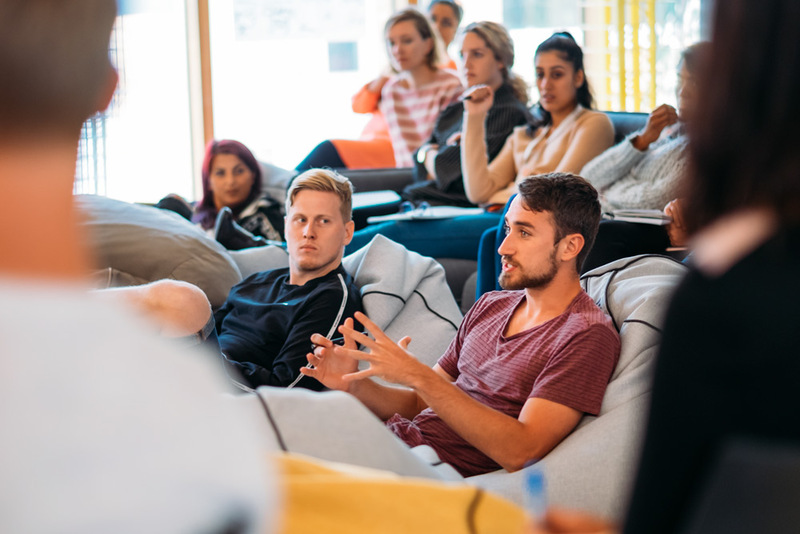 The monthly Startup Victoria Pitch Nights are eponymous with this, being a community where you can engage with other aspiring and experienced entrepreneurs and subject matter experts. Whether you’re an aspiring founder, want to partners with startups, or want to work for a startup, you should go to the monthly Startup Victoria Pitch Nights to get a better sense of the startup landscape and opportunities available. Click here for their events. To hear more from Georgia, follow her on Instagram @gbeattie.